If you’re researching about inheriting an HDB flat in Singapore, it’s possible that you’ve already been through something very difficult such as the death of a family member. While you are in this difficult period of your life, having to figure out HDB inheritance laws is dauntingly complicated. You might have a lot of questions such as “Can I inherit an HDB if I currently own private property?”, “What if the HDB has another owner?”, “Who gets the HDB if the deceased had parents, siblings and children?” and so many others! We want to help you crack this difficult topic. What are the first few things I should know about HDB inheritance? What if the HDB flat has other owners who are alive? How does the owner’s religion affect HDB inheritance law? Can I inherit an HDB flat if I already own an HDB? Can I inherit an HDB flat if I already own a private property? Can I inherit an HDB flat if I already own a commercial property? Do I need to pay any Property Inheritance Tax upon inheriting an HDB flat? Do I need to pay any other fees or duties? 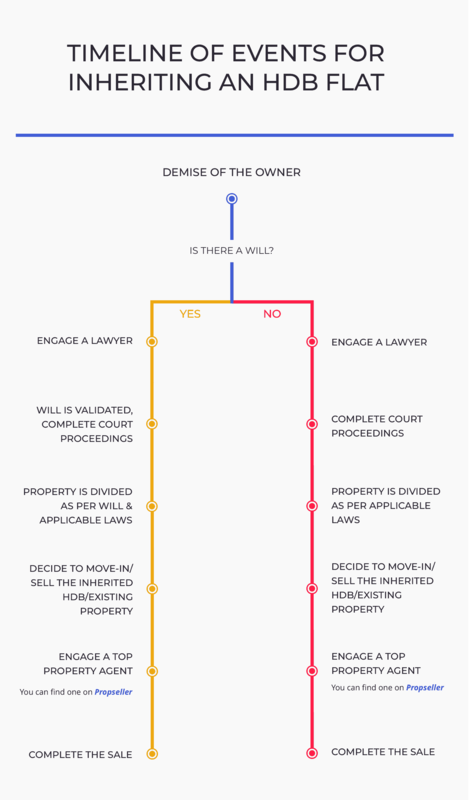 What is the timeline of events for inheriting an HDB flat? 1. What are the first few things I should know about HDB inheritance? You need to empower yourself with the right knowledge when it comes to inheriting an HDB flat owned by a loved one, such as your parent or another family member, who passed away . Whether the deceased owner left behind a Will or not plays a huge part in how the ownership of the HDB is passed down. In essence, if the deceased owner left a Will, the court will need to verify and validate it, after which the ownership of the HDB will be transferred according to the Will. However, if there is no Will, the property will be distributed as per the governing laws based on the owner’s religion. When an HDB owner passes away, his property will be administered and distributed in accordance with the applicable laws. If the deceased owner is Non-Muslim, the Family Justice Court will govern the proceedings. His HDB will be distributed as per the Will (also referred to as “Testate Succession”). However, if he does not leave behind a valid Will, it will be passed in accordance with the “Intestate Succession Act”. We will discuss the acts in depth in a later part of this article. If the owner is Muslim, the Syariah Court will govern it. When a Muslim owner passes away, his HDB will be distributed as per his Will (if there is one) and the “Islamic Inheritance Law”, also knows as “Faraid”. We discuss more on how this works in a later part of the article. This only applies to Non-Muslim HDB owners. A “trustee” can, in theory, be anyone such as a child, a spouse or a friend of the deceased owner. This person is basically the one who will oversee the whole process, is in charge of the paperwork, ensures that the lawyers are paid and that the forms are filled, etc. The duties of a trustee are mentioned in the “Probate & Administration Act”. In case the deceased has left a Will, the Family Justice Court will issue a “grant of Probate” to appoint an “executor” or “trustee” of the Will. The grant of Probate is basically a court order, which entitles the executor to carry out the instructions and distribute the deceased owner’s HDB to the beneficiaries as per the Will. Generally, the deceased owner would mention the executor in his Will. If the deceased owner did not make a Will, one of the beneficiaries, a relative or a trusted friend can apply to the court to be appointed as one. Usually, one of the beneficiaries such as the spouse or the child of the owner is the executor. However, if none of the owner’s relatives or friends wants to be a trustee, the court will appoint an officer to become the executor. In theory, you can submit the applications related to the inheritance of an HDB flat with the court by yourself, without a lawyer. However, if you need a helping hand in doing so, you can engage a lawyer to help you with the related paperwork. 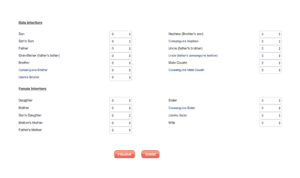 For Non-Muslims, the forms can be found on the Family Just Court’s website under “Forms”. 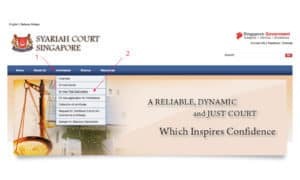 For Muslims, the forms are on the Syariah Court Singapore’s website under “Inheritance”. 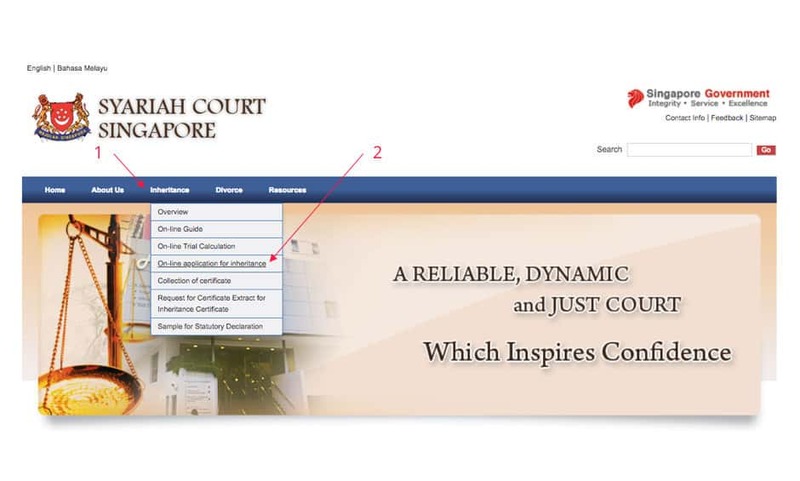 Image 1: Instructions on how to access the online application for inheritance on the Syariah Court Singapore’s website. The screenshot is taken from the site. 2. What if the HDB flat has other owners who are alive? If the HDB of the owner who passed away has other owners such as siblings, spouses or someone else, there are further rules that apply on how the ownership is transferred. Let me explain these terms below. In the case of a Joint Tenancy, all the co-owners have equal interest in the property. In such a case, upon the demise of one of the owners, the interest of the deceased person would automatically be passed on to the remaining co-owners, irrespective of whether the deceased owner has a Will or not. Joint tenancy was more commonly opted for in earlier times by our parents’ and grandparents’ generation. Tommy and Jennie chose “Joint Tenancy” when the two of them purchased an HDB together. This means they both have equal interest in the HDB. They have 2 children – Mark and Vivian. Before his passing, Tommy wrote a Will to distribute his share of the HDB equally to Jennie, Mark and Vivian. 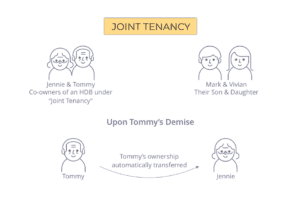 Image 2: Tommy’s ownership will automatically be transferred to Jennie after he passes away since they purchased their HDB under “Joint Tenancy”. However, because Tommy and Jennie were under “Joint Tenancy”, Tommy’s Will is invalid. All of Tommy’s interest is transferred to Jennie automatically, who now has full ownership of the HDB. In case of Tenancy-in-Common, each owner has a separate and distinct interest in the HDB flat. This means that upon the demise of one of the owners, his part of the ownership will be transferred based on inheritance laws and will not automatically be transferred to the co-owner. Tenancy-in-common is more commonly opted for by the current generation of HDB buyers. 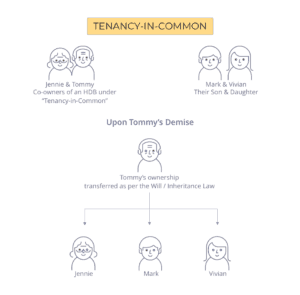 When Tommy and Jennie purchased the HDB, they chose to hold 60% and 40% of the ownership respectively under “Tenancy-in-Common”. They have 2 children – Mark and Vivian. Tommy wrote a Will to distribute his 60% share of the property equally to Jennie, Mark and Vivian (which would mean 20% each). 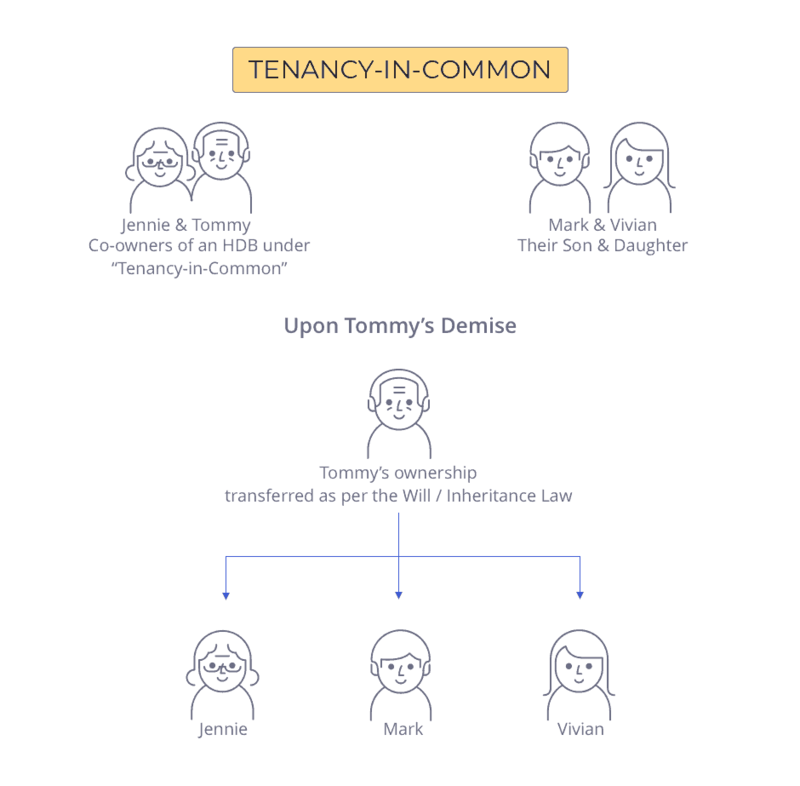 Image 3: Tommy’s ownership will be transferred as per his Will and Inheritance Law after he passes away since he and Jennie purchased their HDB under “Tenancy-in-Common”. 3. How does the owner’s religion affect HDB inheritance? Inheritance laws vary for Muslims and Non-Muslims. It also depends on whether the owner wrote a Will or not. We will cover all these scenarios below. If the owner is Non-Muslim, we first check whether the deceased owner left a Will. If the deceased owner did not leave a Will behind, the ownership of the HDB will be distributed as per the “Intestate Succession Act”. If the HDB owner who passed away has no immediate family members, the ownership can go to their nieces, nephews, aunts or uncles. Finally, if the deceased owner has no living relatives, the ownership will be passed to the State (i.e. the Government). Tommy and Jennie have 2 children – Mark and Vivian. Unfortunately, Tommy recently passed away and did not leave behind a Will. Tommy was the sole owner of his HDB flat. The ownership of HDB is distributed such that, Jennie (Tommy’s wife) gets 50% and Mark and Vivian (Tommy’s children) get 25% each. First, the Will needs to be proved in court through a legal process known as “Probate”. In essence, the court will decide who the beneficiaries are based on the Will. Fowllowing this, if the Will is valid, the flat will be handed down to the owner’s chosen beneficiaries as per the Will. This transfer of ownership through a valid Will is called “Testate Succession”. However, note that the beneficiary on the Will must be eligible to own an HDB. Tommy has 100% ownership of his HDB flat and wrote a Will to give his wife 80% ownership of the HDB flat, and his two children Mark and Vivian 10% each. Upon Tommy’s demise, the court proceeded to validate the Will. Upon validation of the Will, the ownership would be transferred as per Tommy’s instructions in his Will. If the owner is Muslim, the execution of the Will would be in accordance with Syariah Law. To understand the distribution, you first need to understand the “Islamic Inheritance Law”, also referred to as “Faraid”. As per Faraid, the deceased owner’s spouse(s) and immediate family members will get larger portions of the property. The other eligible relatives would get a smaller portions compared to the immediate family members. Furthermore, the male members of the family will get twice the portion of ownership compared to a female family member. For example, a son will receive twice the share of a daughter. Image 4: A list of all the possible beneficiaries for HDB inheritance as per Islamic Inheritance Law (Faraid). The screenshot is taken from Syariah Court Singapore’s website. The above image is taken from the Syariah Court Singapore’s website, where you can see all the possible beneficiaries of inheritance as per Faraid. Image 5: Instructions on how to access the calculator which shows the distribution of inheritance to each family member based on family structure, in accordance with Islamic Inheritance Law (Faraid). The screenshot is taken from Syariah Court Singapore’s website. 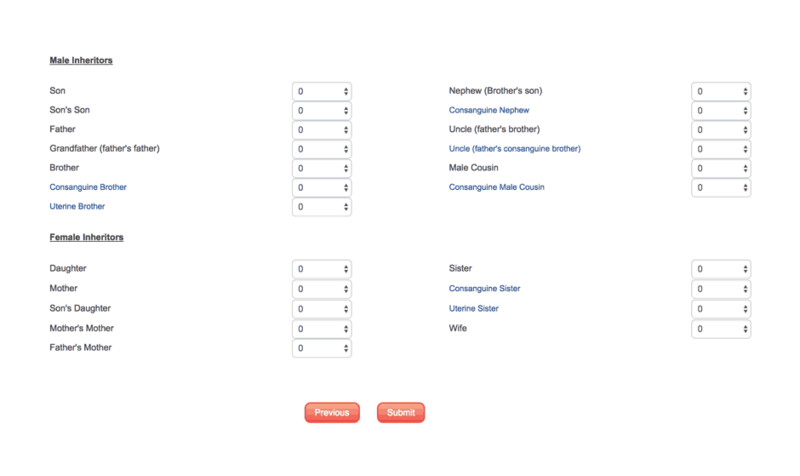 After this, you can choose the number of brothers, sisters, cousins and so on of the deceased family member, and see the number of shares each individual gets as an inheritance. If the owner did not write a Will, the court will distribute the ownership according to Faraid. The Syariah Court would issue an Inheritance Certificate stating the distribution of the property according to Islamic inheritance laws. The Will can not include someone who is already a beneficiary under Faraid. 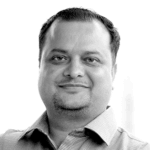 The court will distribute the remaining 2/3rd of the ownership according to Faraid. 4. Can I inherit an HDB flat if I already own an HDB? In short, yes. You can inherit it, but you would have to sell your interest in one of the two HDBs. This is because anyone can own only one HDB flat at a time. You are considered an owner of an HDB flat whether you have full or partial ownership in the HDB. You have 2 options here – you either keep the inherited HDB or you keep your existing HDB. If you decide to keep the inherited HDB, you will have to sell your existing HDB flat (subject to the eligibility conditions for sale, such as the Minimum Occupation Period (MOP)) within 6 months of taking ownership of the HDB flat you have inherited. If you decide to hold on to your existing HDB and not the inherited one, you would need to sell your inherited HDB within 6 months of taking ownership, either to other beneficiaries such as your siblings or in the open market. This only applies if the Minimum Occupation Period (MOP) for the inherited HDB flat has been met. However, if the inherited HDB flat has yet to meet its MOP, you need to approach HDB for assistance. Given the time limits to complete the sale, many sellers engage a property agent to help them complete it in time and at a good price. It would further benefit you to engage an agent who has experience in inheritance sale cases. If you don’t already have one, you can find an experienced agent on Propseller. If you have any questions, you can ask us for free (or you can use the chat icon on the bottom right of your screen). 5. Can I inherit an HDB flat if I already own a private property? Whether a private property owner can inherit an HDB or not depends on when the original owner purchased the HDB flat. If the HDB flat was purchased before 30th August 2010, then you can keep both the properties – the private residential property and the inherited HDB. If the HDB flat was originally purchased on or after 30th August 2010, then you would have to sell one of the two properties. You have to meet the eligibility conditions, such as the citizenship and family nucleus, to own the inherited HDB flat. If you meet them, you and your family will have to live in the HDB flat, if you have decided to transfer the ownership of the inherited HDB flat to yourself. If the Minimum Occupation Period (MOP) of the inherited HDB has been met, you can sell the flat in the open market. If the MOP has not yet been met, you should approach HDB for help and they will assess and see how best they can help. Given that you own a private property, if the HDB you inherited was purchased on or after 30th August 2010 by the owner, you can only keep one property – either the HDB flat (provided you’re eligible to own one) or the private property. If you have decided to keep the inherited HDB flat, you must sell your private property within 6 months and you must also live in the HDB. If you have decided to keep your private property such as your condo, you must sell the HDB flat if it has completed its MOP, within 6 months. If it has not yet completed MOP, get in touch with an HDB officer and they will assist in your exceptional case. Given the timeline restrictions, we recommend you engage a property agent experienced in inherited HDB flat sales. If you don’t already have one, you can find an experienced agent on Propseller, to sell fast and sell high! 6. Can I inherit an HDB flat if I already own a commercial property? Yes, you can inherit an HDB flat if you own a commercial property, provided that the commercial property does not have any residential component. 7. Do I need to pay any Property Inheritance Tax upon inheriting an HDB flat? No, you do not have to pay any Property Inheritance Tax if the owner died on or after 15th Feb 2008. 8. Do I need to pay any other fees or duties? You may have to pay a couple of duties depending on your scenario. If the owner of HDB passed away, and he purchased the HDB flat you inherited before 20th February 2010, then you do not have to pay any SSD. However, if the HDB flat was purchased on or after 20th February 2010, it may be subjected to SSD based on when it was purchased and how long it has been held for. The holding period is counted from the date the deceased owner purchased the HDB flat. Take the example below for how you can calculate the holding period. Image 6: Holding period calculation for HDB flats that have been inherited. So, even though you inherited the HDB only 4 months before the sale date, the holding period is actually calculated from the original date of purchase of the HDB. Your SSD will be calculated based on this holding period. In this example, you are not subject to any SSD. You can find the SSD rates based on the date of purchase and holding period on IRAS’s website. Once you have inherited the HDB flat, even though you did not buy it, you are now the owner of the property. Hence, if you choose to buy another property, then you would be liable to pay ABSD on that new property. You can check the ABSD rates on the IRAS’s website. 9. 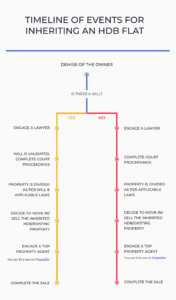 What is the timeline of events for inheriting an HDB flat? The timeline of events when it comes to inheritance is as shown in the image below. Image 7: The timeline of events for inheriting an HDB after the owner passes away. In conclusion, inheritance is a complicated subject and there are many scenarios that can play out, but you can follow the steps in this guide to simplify it. Firstly, a couple of important things to address are the Will and engaging a lawyer, if you don’t want to handle all the paperwork by yourself. Secondly, read about the inheritance laws based on whether the HDB owner who passed away was Muslim or Non-Muslim. Thirdly, you need to determine if you need to sell either your existing property or the inherited one, in a situation where you own both. Finally, if you need to sell, engage a property agent experienced with inheritance cases, as a time limit applies to them. Have any questions about HDB inheritance? Ask us in the comments or on the chat icon on the bottom right of your screen!